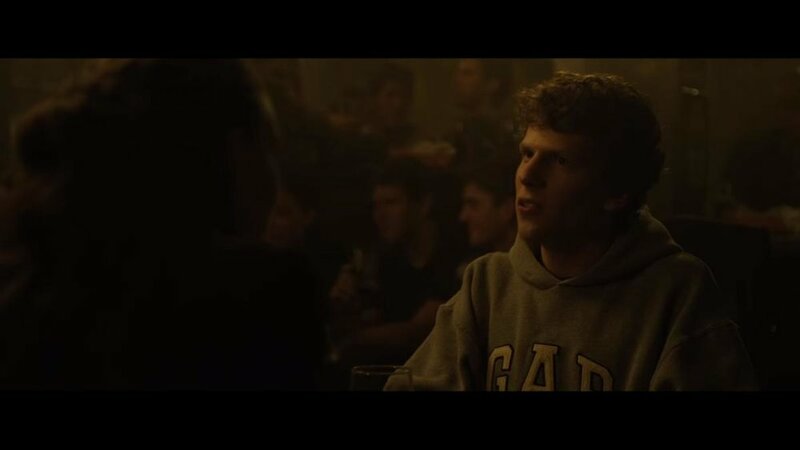 Hi guys, I have couple questions about lighting in David Fincher's films, although you can find such lighting in tons of other films too. I'm talking about this lighting from above. First of all, what lights do you thinks he uses and what makes them so soft? Is it just soft box and diffuser or something else? And second, how do you attach lights to the ceiling? Is there any special rig that you can buy that you can attach light to? I know that sometimes its just practical light on location, but what if I actually want to attach my light to the ceiling, without using any c-stands. Some ceilings have convenient pipes or beams that can be rigged to, otherwise, if there is a drop ceiling, there might be something behind a panel that can be rigged to. Or if the light is lightweight enough, like a LiteMat 2L or a 4' 2-bank or single-bank Kino, you might be able to use a piece of wood that spans the gap in a drop ceiling with the panel removed, with a baby spud nail-on plate attached to the piece of wood, and grip clamps to hold the wood strip in place at each end. Or use paper lanterns. Or rig a white card at an angle to the ceiling and hit it with a Source-4 Leko on a stand off-camera for a bounce light. You can also use wall spreaders span a ceiling with a plank of wood or piece of pipe for rigging, or a goalpost rig of two big stands at each end of the space just outside the view of the lens, with a pipe between them. Or a "menace arm" rig, which is one big stand with a pipe extended from it with a lamp at the end of it, properly counterbalanced and weighted, etc. Any of these rigs requires good grips to rig safely and should use safety chains and lines to keep anything from falling down on people by accident. I've heard quite a few tales recently about people just getting LED sticky strip (presumably the good, expensive stuff from Litegear) and sticking it to things. At least twice people have mentioned using the black corrugated plastic sheets that are used to protect location floors. It's so light it can practically be held up with duct tape and if it falls on anyone it's not going to do any serious damage. You'd need a lot of it to do the top example, but the bottom example could well be something like that. It's not necessarily a low cost approach as LED strip of sufficient quality that you'd want to key a scene with it is not very cheap and you would need a lot of it to achieve any significant output, but this sort of thing is increasingly being done. A formalised version of that is something like Aladdin's Fabric Light, which is designed to be rigged into a frame like a diffusion panel but could be used similarly. Flexible LED panels are brilliant for this sort of thing, as you can rig them from the ceiling with nothing more complicated than gaffer tape and string if you want to. You can see exactly how that one shot was lit at about 1:15 on this video. Theres probably a better quality version out there. The Blu-ray of the Social Network has a ton of great extras. One thing I never quite understand about this is how they're lighting the girl with what looks to be at least a three-foot-square softbox, but at some point you presumably have to show a wide which just isn't going to match at all. Sometimes it's more distracting to NOT adjust the lighting when going in tighter. A light falling on a face in a certain way could work fine for a wide shot but would be less acceptable in a close-up because the viewer's eye is concentrating now on different things compared to the wide. 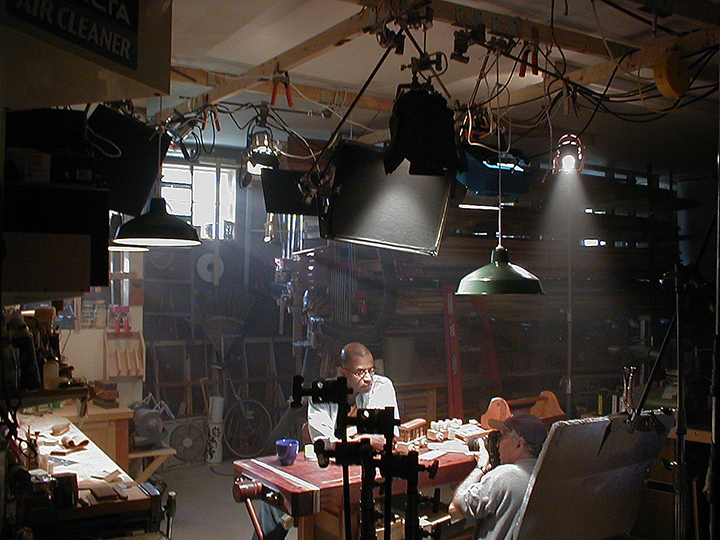 An amazing cinematographer I used to work for always said: Don't spend too much time in your wide shot because the close up is where you are going to use all your lighting time and sometimes it takes more time to light a close-up than a wide shot and the audience won't care about lighting continuity! 2) Ideally you'd light a master shot so well that you wouldn't have to adjust for the close-ups. That rarely happens in real life but it's a goal for a number of reasons, mainly continuity of lighting from wide to tight, and saving time plus being able to jump into covering performances quickly without losing the cast to the trailers. So it's a good idea to design the master shot lighting with how you are going to adjust it if necessary for the close-ups without having to tear down a lot of lighting or bring in a lot of lighting. 3) Lighting continuity all depends on camera angles and sizes -- if you jump from a wider than head-to-toe 3/4 angle to a more frontal head-and-shoulders close-up, you have more flexibility to adjust the lighting than if you jump in from a thighs-up master to a chest-up single on the same line. 4) How much you can cheat is a matter of personal taste, but audiences often don't notice if the key light in the close-up is a bit softer and gets into the eyes better compared to the wide shot, in fact, as I said, sometimes it is more distracting if you don't adjust the light for the close-ups. I discussed number 1 with him a lot because I always thought that lighting a wide shot well was a super good thing.. and he agreed with me on that but said that the way he lit wide shots was usually extremely easy and quick because of his style (and also because he had 20 electricians, tons of grips, etc, etc.) and that he liked lighting faces the most and he felt that the story was always told in close-ups so he had to light "the stars" well. In fairness, if you take a look at all the Tv Series he has worked on.. the wide shot is rarely seen for more than 5 seconds in any given sequence, sadly. He did number 2 too and he created a super big soft box with hundreds of dimmable bulbs (and in different sizes) that was really light and portable and he used it all the time for close ups (when he could! ), beautiful soft light. What I loved the most about looking at how he set things up was the way he positioned all the cameras. Even if only on the screen for 5 seconds, the wide shot defines the scene and space. It's very important for good story telling. And is the most difficult to light when on location when there may be few places to hide lamps. I'm always ready to relight the close up more effectively, but also ready to match the feel of the wide shot. I guess what I'm saying is that my close ups are defined by the best wide shot I can devise given the situation with the set. .... how do you attach lights to the ceiling? Is there any special rig that you can buy that you can attach light to? I know that sometimes its just practical light on location, but what if I actually want to attach my light to the ceiling, without using any c-stands. I don't find taping LEDs to the ceiling to provide very good modeling. One of the biggest challenges in situations like this is getting light into the eyes of your talent. If you don't, your talent's eye will look dark and bruised because a very toppy light rigged overhead won't dig into their eye sockets. As you can see here, with the right rigging equipment you can use drop ceilings like a studio grid. 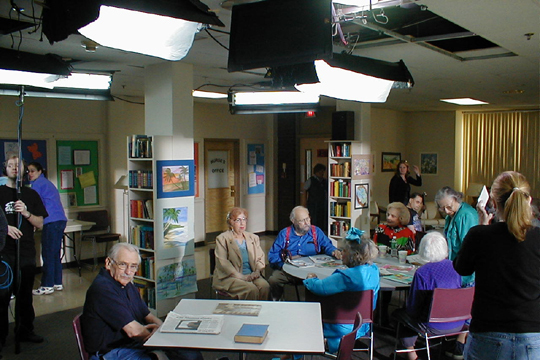 Use this link for more pictures of productions that used drop ceilings on location as if they were a studio grid.